Anderson, Michelle D. 2007. Lonicera hispidula. In: Fire Effects Information System, [Online]. U.S. Department of Agriculture, Forest Service, Rocky Mountain Research Station, Fire Sciences Laboratory (Producer). Available: https://www.fs.fed.us /database/feis/plants/vine/lonhis/all.html . In September of 2006 an extensive search was done to locate information on pink honeysuckle with little success (see FEIS's list of source literature). The following paragraphs provide details of what information was available. Pink honeysuckle is found in western North America, from British Columbia south to California [14,15,16,23]. It is more prevalent in coastal regions than interior regions . Plants Database provides a distributional map of pink honeysuckle and its infrataxa. This description provides characteristics that may be relevant to fire ecology, and is not meant for identification. Keys for identification are available (e.g., [14,15]). Pink honeysuckle is a native, woody evergreen liana [15,16] with a sprawling or climbing growth form [14,17,18,21,23]. It reaches 6 to 20 feet (1.8-6.0 m) in height . It seldom blooms , but when it does, pink honeysuckle displays a spike inflorescence with paired flowers 0.4 to 0.8 inch (1-2 cm) long [14,15,23]. Pink honeysuckle is a submontane to montane species. It grows in maritime to submaritime, summer-dry climates [18,34]. Pink honeysuckle is found on south or west aspects with gentle to moderate slopes [7,28]. It is characteristic of moisture-deficient sites and occurs sporadically on "water-shedding" sites [18,23]. Soils are generally very dry to moderately dry [7,18,33,34] and often acidic (pH 4.0-6.5) . Pink honeysuckle is typical of California riparian areas, though more commonly found in coastal riparian areas than in Central Valley riparian areas [7,14,17,27]. It has been described as a wetland plant . The elevation range for pink honeysuckle in California and Oregon is 1,500 to 3,500 feet (450-1,070 m) . 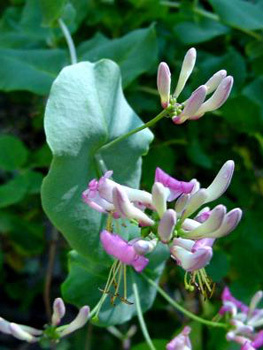 Pink honeysuckle is described as both shade tolerant and shade intolerant; it is found in thickets and climbing trees in open-canopy forests [18,23]. Nongame birds eat pink honeysuckle fruits . Pink honeysuckle is a foliar host for the pathogen sudden oak death mold (Phytophthora ramorum) which causes "sudden oak death", a deadly canker disease of tanoak (Lithocarpus densiflorus), coast live oak (Quercus agrifolia), California black oak (Q. kelloggii), and interior live oak (Q. wislizenii) in California and Oregon [12,22,26,30]. Pink honeysuckle is likely top-killed by fire and may sprout after fire . Further research is needed on all aspects of pink honeysuckle. The following table provides fire regime information that may be relevant to pink honeysuckle habitats. Follow the links in the table to documents that provide more detailed information on these fire regimes. Find further fire regime information for the plant communities in which this species may occur by entering the species name in the FEIS home page under "Find Fire Regimes". Fire regime information on vegetation communities in which pink honeysuckle may occur. This information is taken from the LANDFIRE Rapid Assessment Vegetation Models , which were developed by local experts using available literature, local data, and/or expert opinion. This table summarizes fire regime characteristics for each plant community listed. The PDF file linked from each plant community name describes the model and synthesizes the knowledge available on vegetation composition, structure, and dynamics in that community. Cells are blank where information is not available in the Rapid Assessment Vegetation Model. Surface or low: Any fire that causes less than 25% upper layer replacement and/or removal in a vegetation-fuel class but burns 5% or more of the area [13,19].